Members of the Department of Chemistry of Lomonosov Moscow State University have created unique polymer matrices for polymer composites based on novel phthalonitrile monomers. The materials are stronger than metals, which helps to decrease the mass of aircraft parts that operate at high temperatures. Scientists have published the project results in the Journal of Applied Polymer Science. A team of scientists from Lomonosov Moscow State University led by Alexey V. Kepman, a leading researcher, is developing structural polymer composite materials for production of vehicle components and structural elements for the aerospace industry, where material requirements are much higher, requiring high-performance polymer composites. These are made of a polymer matrix and a reinforcement material (filling agent) that remain separate and distinct within the finished structure. For example, in carbon fiber reinforced composites (CFRP), carbon fabrics are used as a reinforcing agent while polyester or epoxy resins, bismaleimides, polyimides, and many other polymers comprise the matrix. A modern airplane—e.g. the Boeing 787 Dreamliner—consists of 50 percent polymer composites; a fighter aircraft like the Eurofighter consists of 70 percent polymer composites. 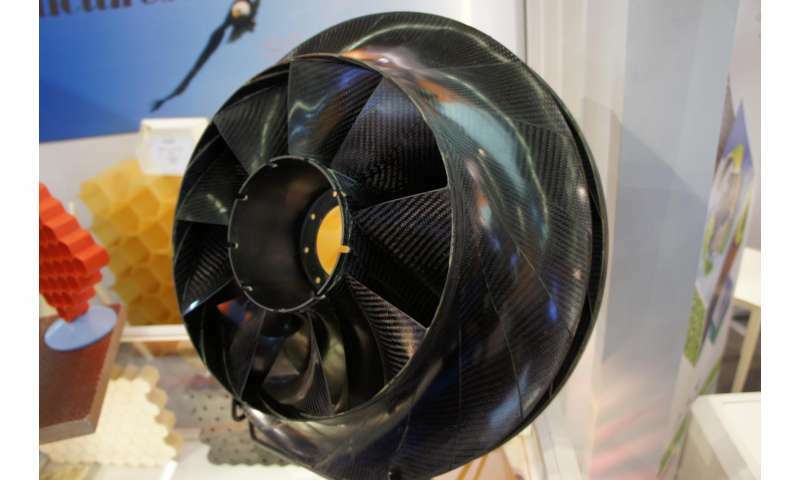 Development of high-temperature polymer composites will replace existing metal engine parts (for instance, low-pressure jet compressor blades) or supersonic aircraft body elements. Chemists have applied a new approach to molecular design of bis-phthalonitrile monomers that are used as starting materials for polymer matrices. They have also developed materials with improved processing requirements suitable for cost-effective injection methods for CFRP manufacturing which is uncommon for most phthalonitriles known to date. Such methods produce high-integrity CFRP parts of complex shape with minimal junction of elements. One kilogram of titanium or aluminum alloy is currently much cheaper than the same amount of polymer composite. However, according to researcher Boris Bulgakov, production and maintenance of large complex shape parts made of polymer composites is vastly cheaper. Cost effectiveness is derived from a significant decrease of labor requirements for the assembly process and a high level of integrity of the resulting carbon fiber structures. Boris Bulgakov explains, "For instance, a wing made of polymer composites is assembled by the junction of 10 elements and a metal wing made of 100 elements. This means that construction of a metal wing costs more. Moreover, strength of CFRP is six to eight times higher than that of aluminum, and at the same time, CFRP density is 1.5 times lower." Polymer composites are widely used for production of premium automobiles, Formula-1 racing bolides, airplanes and spacecraft. Weight decrease in airplanes results in increased fuel economy and aircraft useful load. Thus, the production cost of polymer composites is compensated by a reduction of fuel consumption and an increase in cargo capacity. Additionally, polymer composites are less expensive to maintain since they are not susceptible to corrosion. If they replaced all of the metal wires with carbon nanotube wiring, they would save more weight than you could imagine. If they made the hydraulic cabling out of spun carbon nanotube woven like a fire-hose, you would see similar weight savings.